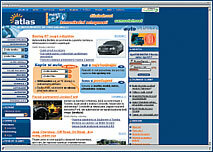 While buying a car online is not quite like buying a CD or even a computer, there is still much to be gained from investigating the “network of all networks.” Those without a web presence may not agree, but car dealers who have wisely put their stock online claim that internet shopping can save buyers significant time and money. 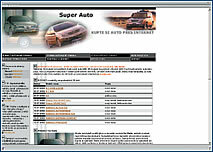 This site offers the possibility to buy Renault, Hyundai and Citroe¨n cars. In the first “room” of a selected brand, you will find links to models and versions, in alphabetic order, but no indication of class. After you choose the model, you can check basic options, choose an exact type, additional options and colors, etc. You can then send out the order, with your name and contact information, but as the order is only preliminary based on the website’s information, a representative of the firm will probably contact you to negotiate the particulars. Beyond that, it is impossible to find any information about how purchasing over superauto.cz actually works. This section of Atlas devoted to everything about motorsport also offers the option of buying second-hand automobiles, as the server cooperates with roughly 70 dealers in the country. To get your car you may take several routes. Start by choosing the class or brand, or “build” your car step by step, selecting the type of car, type of engine, accessories, etc. A handy tool allows users to put the “best candidates” next to each other and compare them. When you make your decision, just fill out a form with your personal information and send it. Afterwards the dealer’s representative will contact you. 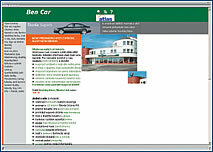 Very user-friendly with interesting graphics, this virtual shop offers Škoda cars. You can make an order in two ways – either you describe your own car according to your needs, and then order it to be manufactured, or you choose from cars that are already available from the warehouse. The website offers easy-to-use services, beginning with detailed information on how the site works, through the possibility for a rather detailed selection of your car, the calculation of insurance or leasing costs, as well as the ability to monitor the status of your order. There are several different methods of payment, and you can even have your car delivered. 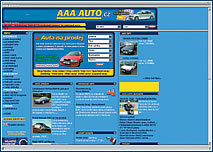 Second-hand car dealer AAA enables users to choose from its wide selection of used cars even through the internet. Searching is simple: for instance, you can find a car according to preferred criteria (let’s say diesel engine). Next you go to a page where all the available cars are lined up with descriptions of their basic attributes. Or you can go step by step choosing one particular after another. Finally, you may reserve the vehicle you’ve selected. A multilingual guide to the Czech Republic. You click on a specific part of the Czech Republic map and then choose the desired subject from the menu. From the homepage, you can find information on all types of schools, music clubs, auto bazaars, rental agencies, restaurants, state institutions, and more. However, for the time being, the extent of the databases is far from satisfactory. Also, those with older versions of Netscape may have some difficulty loading the site at all. Another new subsection of iHNed.cz server, this time devoted to traveling abroad. The main service enables e-customers to search and purchase online tickets or holidays according to selected criteria. Among other information, one can find useful articles on liability, travel or medical insurance, or debit cards. Last but not least, there’s also up-to-date exchange rates. These pages are devoted to the European Union, providing visitors with historical facts regarding the origin of the union, information on its institutions, official documents and basic information on member countries. You can also read some articles on the euro or on the readiness of Czech firms for entry into the union. Last but not least, users will find a lot of information on study or work opportunities in EU-member countries. Igor will help you search for, and potentially book, accomodation across the entire Czech Republic. First, enter the required locality and the price you are willing to pay, then, step by step, make your requirements more specific until, you finally send out the order. According to information provided by the website, your order should be either confirmed or denied over the phone within fifteen minutes. – (RTP) is an internet protocol standard that specifies a way for programs to manage the real-time transmission of multimedia data over either unicast or multicast network services. RTP does not in itself guarantee real-time delivery of multimedia data; it does, however, provide the capability of managing the data as it arrives to optimal effect.